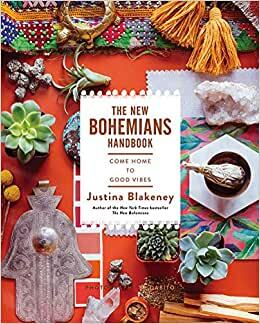 Bohemian style-leader Justina Blakeney is back with fresh design advice and free-spirited inspiration in this colourful companion to the The New Bohemians. Start reading The New Bohemians Handbook: Come Home to Good Vibes on your Kindle in under a minute. "Justina's style is so warm and colorful. She makes much more than moments. She makes life feel bright and hopeful. All her plants and pallets and prints are put together in ways that are beyond stylish. It is art. It makes you want to live in her worlds." --Drew Barrymore "actress, author "
"An indispensable manual to living in a home that's pretty, restful, groovy and 100% you. This is my spirit book! Finally a book that offers specific, helpful ways to make a home feel original, beautiful and, most importantly, like a haven for its homeowner. Plus: crystals!!" --Sophie Donelson "Editor in Chief, House Beautiful "
"Justina is a magical human who really understands how to live well and create a space you love. Not only is this book an excellent read, it also feels like you're having a straight up convo with Justina about how to make your space cooler, original and more inspiring. Very good vibes." --Jessica Romm Perez "Editor in Chief, Domino "
Founder of the award-winning blog TheJungalow.com and author of the New York Times bestselling book The New Bohemians, designer and artist Justina Blakeney is the go-to source for bohemian design inspiration. Her eponymous lifestyle brand, Justina Blakeney Home, includes home furnishings and accessories with: Loloi, Hygge & West, Selamat, Jonathan Louis, Valdese Weavers, Studio Oh!, Wedding Paper Divas, and Peking Handicraft. Blakeney lives in Los Angeles. The content of the book is a lot of fun. Pictures are abundant and clear, really lovely to look at with many ideas. One tiny problem I have is not with the contents of the book, but the actual form of the book. The book itself is only 7 x 9 inches. The paper is thick, making for wonderful quality photos, but too thick to easily read. It's very difficult to keep the book open to read it. Would have been better if in larger form, thinner paper or spiral binding. Justina Blakeney's New Boho Handbook is even richer, more beautiful, and more inspiring than I, who loved the first book, could have expected. We jumped right in to figuring out each of our "Spirit Environments" (pages 92-121). Knowing that he is Grasslands/Jungle and I am Mountain/Beach gives us a way to talk and laugh about our styles, comfort needs, and sources of inspiration. Every page offers a great, doable idea: we began today with rotating furniture to find a better Flow; then went on to changing bedclothes and wall hangings to warmer, complementary colors for winter & moving the fiddle leaf fig to a focal point. Now we are looking at our spaces for Swing, Clarity, Harmony, Spirit. I am newly retired--which means I am home more and I get to --- need to--- make my home a cozy, creative incubator for nurturing my newly liberated soul. Blakeney's New Boho Handbook will be my self-help guide to (re)creating an inspirational space for the next phase. 51 people found this helpful. Pretty basic stuff, thought I'd find something new in this, but I didn't, if your a novice then it's a good book, if you've decorated like this for years, don't bother buying it. 5.0 out of 5 starsNew and even better! Justina outdoes herself with a new excellent book. Filled not only with beautiful photos, but also great advice and help on how to get that beautifully undone bohemian look, white still looking cohesive. I stayed inspired and have combed through it throughoughly multiple times already!